Myanmar - swift and strong (from the native words, myan meaning swift and ma meaning strong). Officially known as the Union of Myanmar, (also as Burma or the Union of Burma by bodies and states who do not recognize the ruling military junta), this nation is the largest in Southeast Asia, and has a population of just over 50 million people. It is bordered by the People's Republic of China on the north, Laos on the east, Thailand on the southeast, Bangladesh on the west, and India on the northwest, with the Andaman Sea to the south, and the Bay of Bengal to the southwest. There are over 1,243 miles (2,000 km) of coastline. Myanmar has gone from being the wealthiest Southeastern Asian nation in the early twentieth century to one of the poorest in the world in the twenty-first century. Its people are known to be kind and gentle, having maintained their dignity through much political and social upheaval in the last century. Burma is derived from the Burmese word "Bamar" ( ), which in turn is the colloquial form of Myanmar ( ) (or Mranma in old Burmese), both of which historically referred to the majority Burmans (or the Bamar). Depending on the register used the pronunciation would be "Bama" or "Myamah." The name "Burma" has been in use in English since the time of British colonial rule. In 1989 the military junta officially changed the English version of its name from Burma to Myanmar. It also changed the English versions of many place names in the country. Its former capital, Rangoon, is now known as Yangon. The official name of the country in the Burmese language, Myanmar, did not change, however. The new name is a derivative of the Burmese short-form name Myanma Naingngandaw. Because some believe that the military junta had no authority to "officially" change the English name and it was never approved by any sitting legislature in Burma, the change was politically controversial. Although the United Nations, of which Myanmar is a member, endorsed the name change five days after its announcement by the government. acceptance of the name change in the English-speaking world has been slow, with many people still referring to the country as Burma. Major news organizations like the BBC and western governments, including those of the United States and the United Kingdom, still officially refer to it as Burma. The Economist and The New York Times are among several Western publications to regularly use the term "Myanmar." Myanmar is the largest country in mainland Southeast Asia. Located between Bangladesh and Thailand, with India and China to the north, Myanmar covers an area of 678,500 square kilometers (261,970 square miles), of which almost half is forest or woodland. The Andaman Sea lies to the south, and the Bay of Bengal to the southwest. There are over 2,000 kilometers (1,243 miles) of coastline. In the north, the Hengduan Shan Mountains form the border with China. The fertile plains of the Irrawaddy and Thanlwin Rivers are in the central lowlands of Myanmar. Most of the country's population lives in this central lowland. The Shan Plateau lies east of Mandalay. In the south, the Irrawaddy River fans out into a wide and fertile delta. Many crops are grown in this region, which borders the Andaman Sea. The Gulf of Martaban also indents the southern coast of Myanmar and drains into the Andaman Sea. The country itself is divided into two classifications, Lower Myanmar and Upper Myanmar. Lower Myanmar is comprised of coastal areas with thick tropical forests. Almost half of Myanmar is covered in forests that are comprised of teak, rubber, cinchona, acacia, bamboo, ironwood, mangrove, coconut, and betel palm, while the northern highlands are comprised of oak, pine and many varieties of rhododendron. Citrus, bananas, mangoes, and guavas are just a few of the tropical fruits found in the coastal region. The interior of the country is located in what is known as Upper Myanmar. The Irrawaddy River system is of great importance to the country due to the fertility of its deltaic plains, which cover about 18,000 square miles (47,000 square km). The highest peak in Southeast Asia is Hkakabo Razi, which rises to 19,295 feet (5,881 meters). The Arakan Yoma Range forms a natural barrier between India and Myanmar, and has peaks that range between 915 meters (3,000 feet) and 1,525 meters (5,000 feet). It is not uncommon to find geckos in homes and snakes in yards, even in Myanamar's large cities. Other reptiles commonly seen are crocodiles, cobras, pythons and turtles. The exotic parrot is the most well-known of Myanmar’s bird species. Other birds found include crows, pheasants, peafowl and paddybirds. The Mon people are considered to be the first inhabitants of present-day Myanmar, possibly settling as early as 3,000 B.C.E. They settled in central Myanmar and along the Bay of Bengal covering the eastern coast, creating irrigation systems. The Mon established ties with India, in both cultural and commercial ventures. They also built relationships with the people of modern-day Thailand, then Siam. They traveled the Irrawaddy River in search of suitable locations to settle. The Tibeto-Burman speaking Pyu arrived later in the 1st century B.C.E., and established several city states - of which Sri Ksetra was the most powerful - in the central Irrawaddy valley. They established a capital in 628 C.E., near modern day Prome. The Mon and Pyu kingdoms were an active overland trade route between India and China. In the mid-ninth century, the arrival of the Burmans led to the absorption of the Mon and Pyu settlements. Tibeto-Burman speaking Burmans, or the Bamar, began migrating to the Irrawaddy valley from present-day Yunnan's Nanzhao kingdom starting in 7th century C.E.. Filling the power gap left by the Pyu, the Burmans established a small kingdom centered in Bagan in 849. But it was not until the reign of King Anawrahta (1044-1077) that Bagan's influence expanded throughout much of present-day Myanmar. After Anawrahta's capture of the Mon capital of Thaton in 1057, the Burmans adopted Theravada Buddhism from the Mons. The Burmese script was created, based on the Mon script, during the reign of King Kyanzittha (1084-1112). Prosperous from trade, Bagan kings built many magnificent temples and pagodas throughout the country - many of which can still be seen today. Bagan's power slowly waned in 13th century. Kublai Khan's Mongol forces invaded northern Burma beginning in 1277, and sacked Bagan city itself in 1287. Bagan's over two century reign of Irrawaddy valley and its periphery was over. In a series of wars (1824–1826, 1851–1852 and 1885–1886) Burma lost territory to the British and became a province of India under British rule. On April 1, 1937, Burma became a separately administered colony independent of the Indian administration. During World War II, Burma became a major front in the Southeast Asian Theater. After initial successes by the Japanese in the Burma Campaign which saw them expel the British from most of Burma, the British fought back and by July 1945 had retaken the country. Burmese fought for both sides in the war. The Burma 1st Division, the Kachin Levies, the Karen Rifles and formations such as the American-Kachin Rangers fought for the Allies, and the Burmese National Army under the command of U Aung San fought for the Japanese. By the end of the war, the Burmese National Army was known as the Anti-Fascist People's Freedom League (AFPFL), still under the leadership of U Aung San. Following the war, the AFPFL attempted to work with British in an effort to gain the independence of Myanmar. In April 1947 they won a majority of the constitutional assembly seats. Three months later, U Aung San's political adversary, U Saw, had him, along with most of his cabinet, assassinated. Myanmar's leader, as well as the AFPFL's, during its early years of independence was U Nu, a former student leader and the foreign minister of Ba Maw. On January 4, 1948, the nation became an independent republic, known as the Union of Burma, with Sao Shwe Thaik as its first President and U Nu as its first prime minister. There was a bicameral parliament consisting of a Chamber of Deputies and a Chamber of Nationalities. Democratic rule ended in 1962 with a military coup d'état led by General Ne Win. Ne Win ruled for nearly 26 years, bringing in harsh reforms. In 1990, free elections were held for the first time in almost 30 years, but the landslide victory of the NLD (National League of Democracy), the party of Aung San Suu Kyi, was voided when the military refused to step down. 2007 saw a campaign of civil resistance led by thousands of Buddhist monks. In February 2008, the military junta announced that elections would be held in 2010. A new flag was adopted and the official name of the country changed to "Republic of the Union of Myanmar." The elections resulted in a victory for the military-backed Union Solidarity and Development Party. The popular National League for Democracy led by Aung San Suu Kyi had been declared illegal and barred from political activities. However, following the elections, the government ended the house arrest of Aung San Suu Kyi. The constitution of Burma, its third since independence, was drafted by its military rulers and published in September 2008. The country is governed as a presidential republic with a bicameral legislature, with a portion of legislatures appointed by the military and others elected in general elections. The current head of state is Thein Sein, who was inaugurated as President on March 30, 2011. The country was ruled by a military junta led by General Ne Win from 1962 to 1988, and its political system today remains under the tight control of its military dictatorship, since 1992, led by Senior General Than Shwe. Senior General Than Shwe holds the title of "Chairman of the State Peace and Development Council." His appointed prime minister was Khin Nyunt until October 19, 2004, when he was replaced by Gen. Soe Win. Thein Sein replaced Soe Win after his death in October 2007. United States sanctions against the military government have been largely ineffective, due to loopholes in the sanctions and the willingness of mainly Asian businesses to continue investing in Myanmar and to initiate new investments, particularly in natural resource extraction. The regime's human rights record is a subject of concern for a large number of international organizations. There is no independent judiciary in Myanmar and political opposition to the military government is not tolerated. In 1988 protests against economic mismanagement and political oppression resulted in what came to be known as the 8888 Uprising. On August 8, approximately three thousand people were shot and killed by the military. The uprising resulted in the fall of the dictator U Ne Win, The following month, September 1988, the Defense Minister, Genreal Saw Maung, declared the establishment of a State Law and Order Restoration Council (SLORC) that promised to re-establish law and order. The 1988 uprising played a key role in causing elections to be held in 1990. Aung San Suu Kyi's opposition party, the NLD, won 83 percent of the parliamentary seats in the election. But the military refused to acknowledge the election results. As a result of her efforts to restore democratic rule to Myanmar, she won the Nobel Peace Prize in 1991. However, she has been repeatedly placed under house arrest by the military junta. Despite a direct appeal by Kofi Annan to Than Shwe and pressure by ASEAN, the Burmese government extended Aung San Suu Kyi's house arrest another year on May 27, 2006. The junta faces increasing international isolation. Burma's situation was referred to the U.N. Security Council for the first time in December 2005 for an informal consultation. ASEAN has also stated its frustration with Burma's government. However, with China supporting the junta, any dramatic change in the country's political situation seems unlikely. In November 2005, the military junta began shifting the seat of government from Yangon to the Pyinmana area of central Burma. On March 27, 2006, they officially named the new capital Naypyidaw, meaning "seat of kings." Burma's national hero in the twentieth century is the founder of the modern Burmese army and one of the leaders of the fight for independence, General Aung San, a student-turned activist. His daughter is the 1991 Nobel Peace Laureate and worldwide peace, freedom and democracy icon Aung San Suu Kyi of the NLD, who was held under house arrest intermittently between 1989 and 2010 before becoming the first State Counsellor, a position akin to a prime minister. Another well-known Burmese figure in the world is U Thant, who was U.N. Secretary General for two terms and highly respected in the history of the United Nations, most notably for his handling of the Cuban Missile Crisis. Myanmar is divided into seven states and seven divisions. Myanmar is divided into seven states and seven divisions. Divisions are predominantly Bamar, the dominant ethnic group that is about 68 percent of the population. States, in essence, are divisions in which particular ethnic minorities exist. Within the states, there are ethnic-based movements for self-autonomy and independence. The administrative divisions are further subdivided into townships, wards, and villages. Major cities such as Yangon and Mandalay have larger metropolitan areas. Therefore, townships in the suburbs of such cities are designated as myo-thit (New Town). Upon reaching the government's installed development markers, the New Towns become townships. Under British colonial administration, Myanmar was the wealthiest country in Southeast Asia and was believed to be on the fast track to development. Today, it is one of the poorest nations in the world, suffering from the 1962 military takeover and the Burmese Way to Socialism plan, a plan to consolidate and nationalize all industries. During this period, there was economic mismanagement and stagnation. It is a resource-rich country that suffers from pervasive government controls, inefficient economic policies, and rural poverty. In 1989 the government of Myanmar began decentralizing economic control and has since liberalized certain sectors of the economy. However, the lucrative industries of gems, oil and forestry remain under the control of the military government. Tourism is being encouraged by the government, however fewer than 750,000 tourists enter the country annually. Private enterprises are often co-owned or indirectly owned by the Tatmadaw (the official name of the military). In recent years, both China and India have attempted to strengthen ties with the government due to Myanmar’s extensive oil reserves. Some nations, such as the United States, Canada, and the United Kingdom, have imposed trade sanctions on Myanmar. Foreign investment comes primarily from China, Singapore and Thailand. The most productive sectors continue to be in extractive industries, especially oil and gas, mining, and timber. Other areas, such as manufacturing and services, are struggling with inadequate infrastructure, unpredictable import/export policies, deteriorating health and education systems, and corruption. A major banking crisis in 2003 shuttered the country's 20 private banks and disrupted the economy. 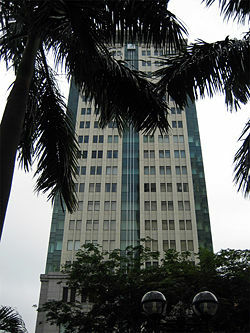 As of December 2005, the largest private banks operate under tight restrictions limiting the private sector's access to formal credit. Myanmar lacks adequate infrastructure and suffers as a result. Goods travel primarily across the Burmese-Thai border and along the Irawaddy River. Railroads are rudimentary, with few repairs since their construction in the nineteenth century. Highways are normally unpaved, except in the major cities. Energy shortages are common throughout the country. Myanmar is the second-largest producer of heroin in the world. Other industries include agricultural goods, textiles, wood products, construction materials, and metals. The lack of an educated workforce also contributes to the growing problems of the Burmese economy. Published statistics on foreign trade are greatly understated because of the size of the black market and unofficial border trade—often estimated to be as large as the official economy. Burma's trade with Thailand, China, and India is rising. Though the Burmese government has good economic relations with its neighbors, better investment and business climates and an improved political situation are needed to promote foreign investment, exports, and tourism. All population figures in Myanmar are at best educated guesses. The British took the last accurate census in the 1930s. The largely unorganized results of the last pre-World War II censuses were destroyed during the Japanese invasion. Estimates range from 50 to 56 million, with the CIA World Factbook giving an estimate of 55,123,814. Roughly three quarters of the population are rural inhabitants, with the remaining population living in urban Yangon, Mandalay and Moulmein. Burmese, the language of the Bamar and official language of Myanmar, is linguistically related to Tibetan and, more distantly, to the Chinese languages. It is written in a script consisting of circular and semi-circular letters adopted, with modifications, from the Mon script, which in turn originated in southern India. The language incorporates widespread usage of honorifics and is age-oriented. The earliest known inscriptions in the Burmese script date from the eleventh century. The script is also used to write Pali, the sacred language of Theravada Buddhism. Because of years of British colonization, English is still spoken in Bamar-dominant areas. English instruction begins during primary school, and most textbook materials from secondary school upward are exclusively written in English. Ethnic minorities, with the exception of overseas groups, tend to speak Burmese as a second language. Myanmar is ethnically diverse. Although the government recognizes over one hundred distinct ethnic groups, the actual number is much lower. The dominant ethnic group are the Bamar, who form what is guessed to be 68 percent of the population and speak Burmese. Ten percent of the population are Shan, who speak Shan dialects, related to Laotian and Thai. The Kayin (Karen) make up seven percent of the population, and speak a variety of Tibeto-Burman languages. The Rakhine (Arakanese), who constitute four percent of the population, are ethnically related to the Bamar, but are culturally different. Overseas Chinese (mainly Hokkien and Cantonese speakers) form approximately three percent of the population, but are primarily unrecognized by the government (in terms of citizenship). Mon, who form two percent of the population, are ethno-linguistically related to the Khmer. Overseas Indians (mainly Tamil, Hindi, and Bengali speakers) comprise two percent as well, and like the Chinese, do not have citizenship rights. The remainder are Kachin, Chin, and other ethnic minorities. The Anglo-Burmese, once forming around 8 percent of the population of the country in total, and forming at least a quarter of the population of Rangoon itself, have decreased in number to around only 52,000 nationwide, with an estimated 1.6 million outside of Burma's borders (see Anglo-Burmese). There are no trustworthy census numbers for the country since the 1930s. All of the estimates with regard to percentages of population are only guesswork with no scientific basis. The existing government continues to honor both colonial laws and laws passed after independence regarding citizenship, granting it only to those who have lineage in Myanmar’s former entities prior to colonization. Overseas groups, particularly the Indians and Chinese, to obtain such citizenship, have intermarried with the local populace, making the percentages more obscure. A person of two ethnic backgrounds is known as kabya. "Citizenship" is generally of dubious value because of open discrimination. Large portions of the population have for years functioned without official citizenship. After the “Burmese Way to Socialism” was enacted in the 1960s, millions of people left the country. Anti-Chinese riots took place during the 1960s and 1970s causing a large but temporary exodus of ethnic Chinese. However, many Chinese have entered the country in recent years. Wars with various ethnic groups in the border areas forced many more people out of the country. In addition, many Indians (Muslim and non-Muslim) returned to Pakistan and India because of similar discriminatory policies. The government is widely known for its persecution of minority groups throughout the country, particularly because of civil unrest and calls for secession and autonomy. Throughout the mid-1990s, the government negotiated treaties to end warfare. However, the government continues to detain and relocate minority groups further from Bamar-dominant areas. In addition, massive refugee camps exist along the borders of both Thailand and Bangladesh. Education in Myanmar has suffered under the military regime mainly as a result of the government's disproportionate expenditure on the military. According to the United Nations, the government spends 222 percent more on the military than on both education and health. After the pro-democracy 8888 Uprising in 1988, the ruling military junta forced the closure of all universities in Myanmar for several years. The government then began to open new universities in the suburbs and rural areas of Mandalay and Yangon to disperse students to several campuses in order to prevent major unrest. The University of Rangoon was once the most prestigious of all universities in Southeast Asia. Originally formed as Rangoon College, an associate college of the University of Calcutta, it later merged with the former Judson College (also known as 'Karen College' because of the large number of ethnic Karen students) to form the University of Rangoon. With the advent of military rule and the banning of English in the 1960s, the university lost its prestige and today is part of the University of Yangon. Buddhism in Myanmar is predominantly Theravada Buddhism and is practiced by 89 percent of the population, especially the Bamar (and its subgroups, including the Rakhine), Shan, Mon, and Chinese. Christianity is practiced by 4 percent of the population, predominantly among the hill dwelling Kachin, Chin and Kayin as a result of missionary work in their respective areas. Christianity is also prevalent among the Anglo-Burmese and Anglo-Indians. Most Christians are Protestants, in particular Baptists of the Myanmar Baptist Convention, founded by the American missionary Adoniram Judson in the ninteenth century. Catholics, Anglicans, Methodists, Mormons, Seventh Day Adventists and Jehovah's Witnesses are all represented as well. Four percent of the population practices Islam; these Muslims include Indians of Indo-Burmese descent, Persian, Arab and Panthay of Chinese descent, and the Rohingya Muslims of Rakhine State. The Muslim population is socially marginalized, and is widely segregated. Small segments of the population practice Hinduism or animism. Due to a lack of accurate census data these percentages are only estimates. There are no reliable figures for the percentages of the population that follow particular religions. Buddhism has been patronized since independence by both civilian and military governments. Large sums of state funds under both military governments and the government of U Nu in the 1950s have been provided for the creation of Buddhist monuments and the general support of Buddhism. The government continually persecutes Christians and Muslims. Religious tolerance is often undermined because of long-held prejudice. Although a diverse range of indigenous cultures exist in Myanmar, the dominant culture is primarily Buddhist and Bamar. Bamar culture has been influenced by the cultures of neighboring China, India, and Thailand. This is reflected in various aspects of its language, cuisine, music, dance and theater. The arts, particularly literature, have historically been influenced by the Burmese form of Theravada Buddhism. Buddhism is practiced along with nat worship which involves elaborate rituals to propitiate one of a pantheon of 37 Nats (ghost spirits). In a traditional Burmese village, there is at least one monastery and monks are venerated and supported by the lay people. The majority of Burmese monks reside in Mandalay Division and Sagaing Division. A novitiation ceremony called Shinbyu is the most important coming of age event for a boy when he briefly enters a monastery. His sisters may have an ear-piercing ceremony (na htwin) at the same time. Burmese culture is most evident in villages where local festivals are held throughout the year, the most important being the pagoda festival (hpaya pwe). 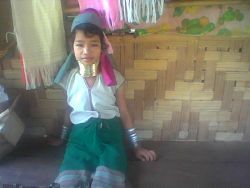 Many villages have a guardian nat, and superstition and taboos are commonplace in Burmese life. 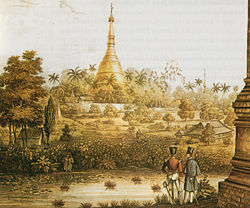 British colonial rule also introduced Western elements of culture to Myanmar. Myanmar's educational system is modeled after that of Great Britain, and colonial architectural influences are most evident in cities such as Yangon and Mawlamyine. Burmese society, from historical times to the present-day, has stressed the importance of education. Literacy in Myanmar is considered important for interpreting religious texts of Theravada Buddhism. 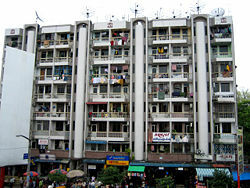 ↑ Government of Myanmar, The 2014 Myanmar Population and Housing Census Highlights of the Main Results Census Report Volume 2 Department of Population Ministry of Immigration and Population, 2015. Retrieved June 27, 2018. ↑ Myanmar Population Worldometers. Retrieved June 27, 2018. ↑ 3.0 3.1 3.2 3.3 International Monetary Fund, Burma (Myanmar) World Economic Outlook Database. Retrieved June 28, 2018. ↑ 4.0 4.1 4.2 4.3 CIA, Burma The World Factbook. Retrieved June 28, 2018. ↑ Leslie Scrivener, The Burma question Toronto Star, October 6, 2007. Retrieved June 28, 2018. ↑ 6.0 6.1 AsianInfo.org, Myanmar's Geography Retrieved June 28, 2018. ↑ AsianInfo.org, Myanmar's Wildlife Retrieved June 28, 2018. ↑ 8.0 8.1 AsianInfo.org, Myanmar's History and Background Retrieved June 28, 2018. ↑ 'Suu Kyi’s Detention Extended, Supporters likely to Protest 'The Irrawaddy, May 27, 2006. Retrieved June 28, 2018. ↑ Burma's New Capital Stages Parade BBC News, March 27, 2006. Retrieved June 28, 2018. This page was last modified on 1 November 2018, at 16:42.